A 26 year-old man sustained an injury of uncertain mechanism to his left eye while at the bottom of a ruck during a game of rugby. Fortunately, his team went on to win 24-16. 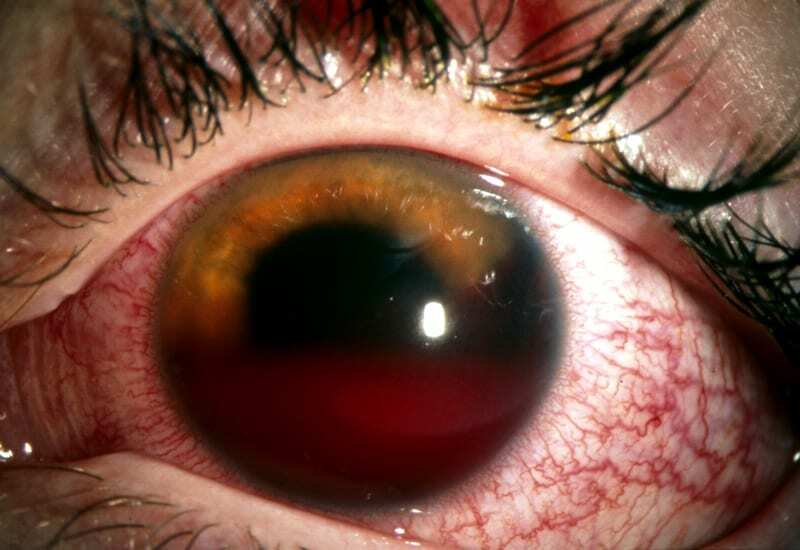 Anterior hyphema — a collection of blood or clot in the anterior chamber, it is usually visible to the naked eye. There is also diffuse conjunctival injection. When clot fills the anterior chamber it is called an 8-ball hyphema. Over time red cells tend to settle on the bottom of the anterior chamber if the patient is upright. When lying down the hyphema may be detectable as a diffuse haziness in the anterior chamber. A microhyphema is only detectable with a slit lamp. Q2. What features should be obtained on history and examination? Symptoms — pain, blurred vision, loss of vision — time course of vision loss may suggest rebleed if recurrent, or continued bleed if longer duration. Injury — Blunt trauma? What happened? When? How? External examination — check for concomitant head and facial/ periorbital injury. Pupils — direct response to light may be decreased in large hyphemas or the pupil may be obscured by blood. Tonometry — check for secondary glaucoma. Slit lamp exam — measure extent (height) of hyphema, assess for clots. Check for microhyphema. Rule out penetrating injury and other eye injuries. fundoscopy and red reflex — blood may cause loss of red reflex, look for retinal injury. Q3. What is the investigation and management of this condition? Consider CT or XR orbits if concerned about blowout fracture or head injury. oral analgesia and topical cycloplegics for comfort. Consider antiemetics. Avoid agents that may contribute to a bleeding diathesis. Surgical evacuation may be required if the hyphema fails to resolve, there is a rebleed or secondary glaucoma occurs. Q4. Which patients with this condition require admission to hospital? Q5. What is appropriate follow up for patients that are discharged? 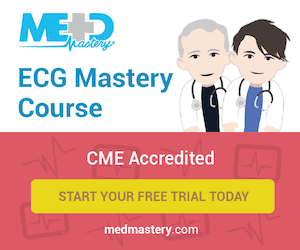 What advice should be given to the patient? Ophthalmology follow up on a daily basis (or on day 3 for a microhyphema). Q6. What are the possible complications of this condition? Your patient is discharged from the emergency department with ophthalmology follow up arranged. However, he returns after 3 days with throbbing eye pain, tearing and photophobia. Inflammation of the iris occurring within 3 days of trauma, typically presenting as a dull aching/ throbbing pain, with tearing and photophobia (both direct and consensual). Q8. What are the examination findings of this new condition? Pupils — The affected pupil may be smaller and dilate poorly, or larger in the presence of iris sphincter tears. There is pain in the traumatised eye on direct and consensual light exposure. Slit lamp: Anterior chamber — cells and flare; Perilimbal conjunctival injection may be present. Tonometry — IOPs may be high or low. Q9. What is the management of this new condition? Ophthalmology follow up should occur within a week.